As I have anticipated in an earlier post, I decided to do away with the complexities associated with single-part molding, and opted for the more conventional, but altogether simpler, approach of making separate molds for the body and the arms, as well as for the combined sword and bayonet frog. 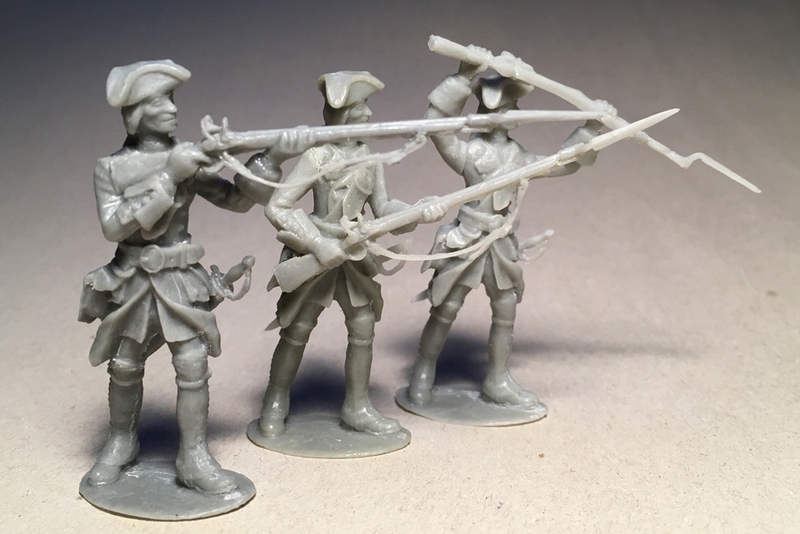 I am quite pleased with the look of these mid 18th-Century British line infantry figures, which are ideal for employment in all the major theatres of the War of the Austrian Succession, including the campaigns in Germany and Flanders (for which I am going to provide suitable French regular infantry counterparts…), the Jacobite Uprising, and King George’s War in North America (as Independent Company men in colonial service). Of course, they may also be used effectively for the Seven Years War and the FIW of 1754-1763 (although the purist war gamer may contend that the coat be perhaps a little too bulky, and the size of the cuffs a bit too large…). The style of the coat cuffs, of distinctive British design, is that of the majority of the infantry regiments as depicted in the Cloathing book of 1742. Many regiments featured lace on the cuffs, lapels, and side vents, but given the variety of designs, I choose not to sculpt lace at all, and left it to be painted in where applicable. Since I am concentrating on the War of the Austrian Succession and the related conflicts of the 1740s, I am painting my first Redcoats as soldiers of the Independent Companies, faced and lined green, with no lace. During the 1740s, the men of the Independent Companies were the only British Army regulars present in North America. Together with the Highlanders, the Independent Companies were the first regular units in the British Army to be employed in petite guerre operations, only later to be replaced by light troops specifically raised and trained for irregular warfare. See pictures of painted Redcoats figures in the GALLERY section (link here).